It’s the usual story with these Japanese guides in that I can’t say too much else about it, but it’s well presented and looks to be fairly thorough with wingmen details, ship/weapon stats, mission guides and everything else you would expect. It doesn’t have the interviews that were in the regular English guide but does have the bonus of being in full colour throughout. It’s now scanned and available to download for anyone who wants a look. This was published in 1995 by Origin via Brady Publishing. This is in the larger format that Origin moved onto around this time and it’s a sizeable book with just over 250 pages . It originally included a CD with some behind the scenes features, which unfortunately wasn’t included with my second-hand copy. 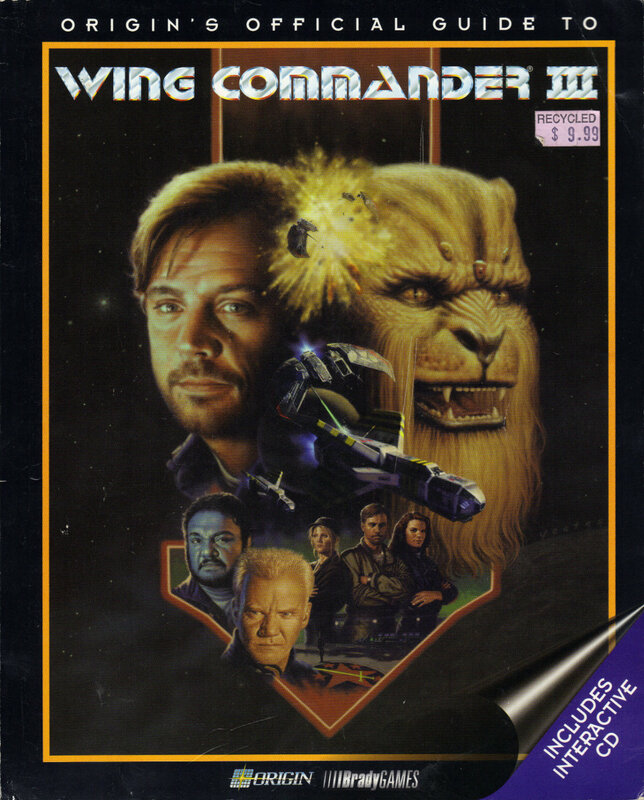 I’m assuming that the “making of” video on the CD would be the same as the one on the limited edition Wing Commander 3 but from the back cover it looks to have other features that weren’t on that disc. With all the extra content compared to the last couple of clue books I’ve looked at, the original price reflects this and this guide originally sold for a hefty $24.95. The book is split in 3 sections, each written by a different author. The first 50 pages are about strategy and tactics. This goes into the stats for all your wingmen, ship specs, general combat tactics and all the mechanics of the game. It even has a list of responses that your wingmen give you in combat. I never actually realised that if they have low morale, all their responses are different. Everything you could ever need to know about how the game works is in here. It’s quite dry stuff but there is a lot of information and it does give you a good feel for all the things going on behind the scenes that aren’t immediately apparent. The second section is about 110 pages and details every mission in the game with tactics and the like. There isn’t much additional info here, other than a few boxes of text with news feeds and one with the transcript of the Hobbes explanation cutscene. I presume the news feeds are from the other scenes that got cut. This is the section of the book to get you through missions you might be struggling with, but there isn’t much here otherwise and I skimmed over it. The final part is an 80 page making of section. 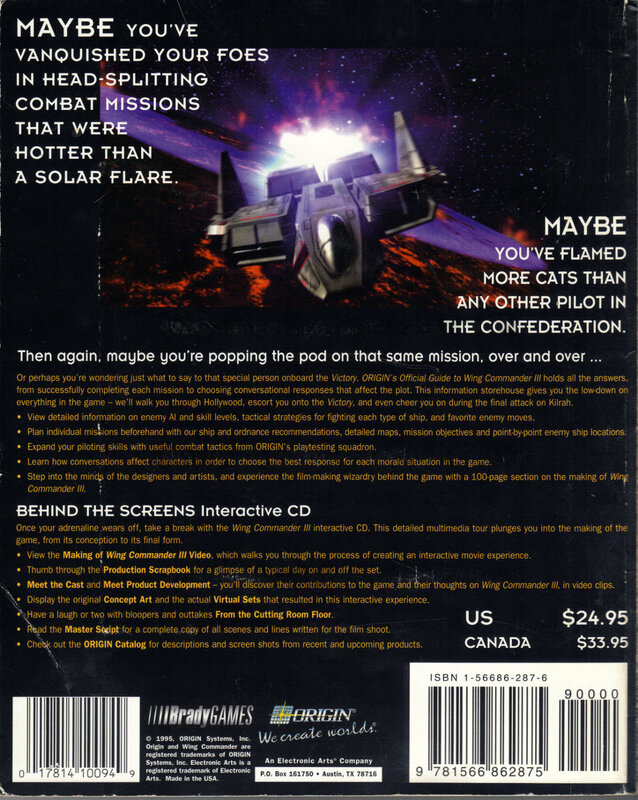 This contains interviews with what must be most of the people involved in making the game. These interviews cover every aspect of the game and include programmers, artists, actors, scriptwriters, producers, packaging/documentation designers, etc.. With so many people included most only get to answer a few questions but you still get a very good idea for what was involved making WC3. Apparently this was one of the few Origin projects than ran more or less on schedule, which is a surprise given the scope of it. It does mention that Strike Commander was basically created just to develop the technology for WC3. Having this in place no doubt helped enormously as I remember all too well just how many delays Strike Commander suffered. Possibly the most interesting fact in the interviews is that Mark Hamill was originally cast as Maniac and was only swapped to Blair when Tom Wilson was signed up. It’s hard to imagine how that would have turned out. The whole making-of section justifies the price of book on its own. It’s heavily pushing the “interactive movie” theme and what effect this had on people’s work compared to their usual work in the film industry. This is no surprise as there was a lot of excitement at the time about interactive movie’s being the next big thing. It didn’t exactly happen the way people expected but I think you can see some of the same mechanics in play in a modern game like Mass Effect, with the dialog choices and cinematic presentation. It may not be FMV any more but it amounts to the same sort of thing with modern graphics. There is plenty of praise for Chris Roberts directing skills from the people interviewed. I have noticed this sort of thing in every making-of that you ever see with a dvd but he obviously did a good job for a first time director. I did think about scanning in the making of section although I’m put off by the sheer size of it so I’ll hold off unless asked. This book was everything an official guide should be with masses of detailed information on playing the game and lots of extra behind the scenes information. It’s definitely worth the few $ it costs to pick it up second-hand although you might want to be more careful that I was and make sure it has the CD.